Sift flour into a bowl. add salt and sugar. Whisk together milk, water, egg, and oil or melted margarine in another bowl. Add wet ingredients to the dry ingredients; mix until well combined. Let rest for 20 minutes. Divide the dough into 8 equal pieces and shape into balls. Brush the balls with oil and let rest for at least 3 hours. Place a ball of dough on an oiled work surface. Flatten the ball with your palms. Flip the dough over and flatten again. Repeat until the dough is very thin, about 1/8-inch thick. Alternatively, you can keep on stretching the dough with your hands. Brush the flattened dough with butter or ghee. Fold the sides into the center and repeat with the top and bottom sides until you form a square. Lightly grease with margarine or ghee. 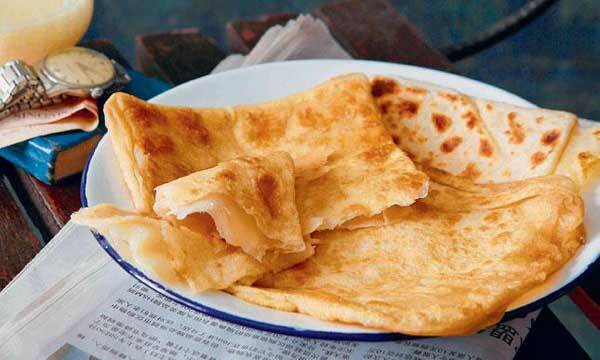 Grill roti until brown spots form on both sides. Repeat steps 6 to 8 with the remaining balls of dough. Serve hot with curry sauce or condensed milk on the side, according to Yummy.ph.